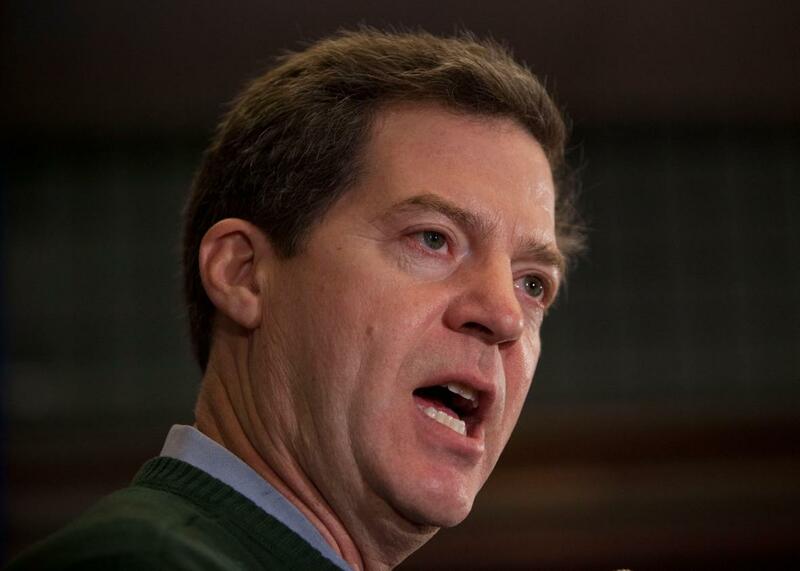 Sam Brownback vetoes Kansas’ Medicaid expansion. I’m not sure if Kansas Gov. Sam Brownback has spoken a word of Yiddish in his life, but holy heck did the man offer up a master class in chutzpah Thursday. Brownback, of course, is the inept conservative governor who gave the words “bloody Kansas” new meaning with a set of massive, ill-conceived tax cuts that have been drowning his state in a sea of red ink ever since they were passed in 2012. The state Legislature is currently puzzling over how to patch a billion-dollar budget shortfall while also adequately funding the state’s public schools in order to comply with a recent court order. Against this backdrop, a large coalition of Democrats and moderate Republicans have been trying to do something sensible by finally adopting the Affordable Care Act’s Medicaid expansion in the state. While the move would cost Kansas some money over the coming years, it would bring in far more in federal funding while potentially extending health insurance to some 150,000 Kansans. Despite Brownback’s veto threats, the expansion bill passed the state Senate and House of Representatives by impressive margins, 25–14 and 81–44 respectively. On Thursday, Brownback made good on his threat and rejected the expansion. Among the reasons cited in his accompanying message: Financial responsibility. The cost of expanding Medicaid under ObamaCare is irresponsible and unsustainable. A recent third party study from Aon Hewitt estimates that expansion will cost Kansas taxpayers of $1.2 billion from the state general fund over the coming years. In fact, states that have expanded have seen cost overruns of 110 percent or more than double the projection of enrollees. This bill is not budget neutral, instead placing a burden on the budget of unrestrainable costs. The horror. More people than projected might get health insurance. This guy blew his state’s budget on fairy dust and tax cuts that have yet to yield jack in terms of economic growth, but now he’s worried about fiscal rectitude. One interpretation is that this is just classic, 1980s-style starve-the-beast conservatism at work—ruthlessly slash revenue in the name of economic growth, then cry poverty when people want to spend on basic social welfare programs. But it’s really not clear to me that Brownback is even that forward-thinking. Supporters of the expansion are apparently a few votes shy of a veto override in both houses of the Legislature, though advocates say they’ll work to flip a few more members. In the meantime, let us all pray that Brownback gets that ambassadorship with the Trump administration he’s supposedly in the running for. Poor Kansas has suffered enough.